Now that we’ve got your attention, let’s make it wander: a thrill-inducing trail with not a soul in sight. A 100 horsepower Rotax engine at your back. Visco-Lok QE four-wheel-drive underfoot. You slip the QRS CVT into drive, squeeze the steering wheel, and… And until that happens, this in-depth Maverick Sport video will be this next best thing. 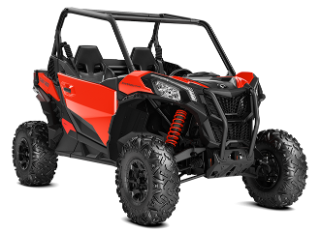 At 75 or 100 horsepower, the torquey, responsive Maverick Sport definitely won't leave you waiting. Battle-tested Rotax V-twin technology has been around the block, around the track and around the world. So it’s only natural that it was the power plant of choice in side-by-side engineering to take you anywhere you want to go. ROPS-approved profiled cage. Certified ISO 3471.